Look at the beautiful color of all those nutrients! Oh dear, January was National Soup month and I didn’t even post a soup recipe!! I will make up for it by introducing one here. You can make it from start to finish in about 10-12 minutes. Prep time is about 3 minutes. Take some broccoli, wash it, cut the ends off, trim the sides, cut into pieces. 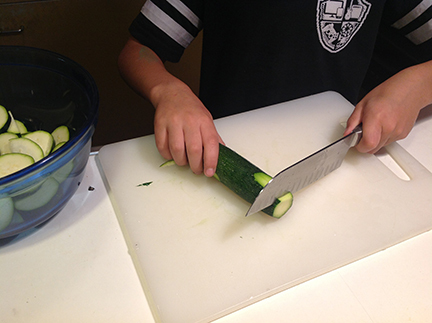 Then cut the stem into slices and divide the florets into smaller pieces. Steam the broccoli in a steamer on the stove for about 8 minutes. You could also probably do it in less time in the microwave. 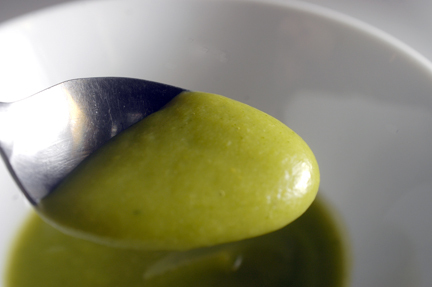 Then throw the cooked broccoli into a blender, pour in some chicken broth and blend until smooth. Add more broth to reach the consistency of your liking. Reheat if it is not hot enough. Eat! 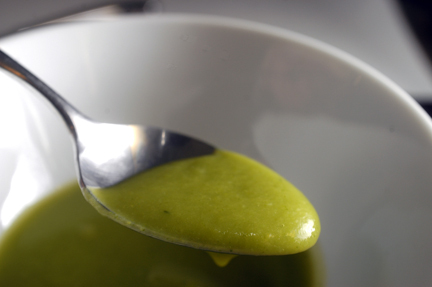 The cooked broccoli gives the soup a natural thickener — much like cooked potato. And the broccoli is full of nutrients and fiber. It really is a perfect veggie. 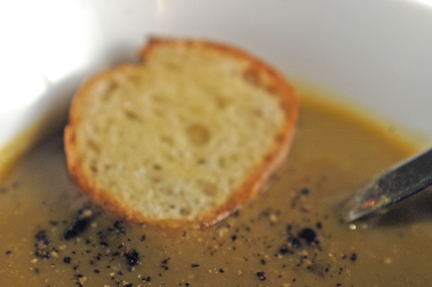 This soup is one of my favorites, and it is so effortless to make. 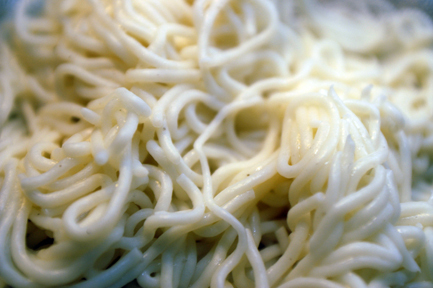 I’ve been eating it a lot this winter– so warming and comforting! See recipe at the end of the post. On the work front, I’ve been very busy with book projects, some freelance work, and a new addiction– taking classes at skillshare.com! My friend introduced me to a lettering class there taught by Mary Kate McDevitt, who is awesome! I couldn’t get enough of these great classes, and I kept signing up for more, because there are so many skills to learn! Also, if you refer a friend, you BOTH get $10 off. I find that the best way to learn a new skill is to just do it, and keep practicing. 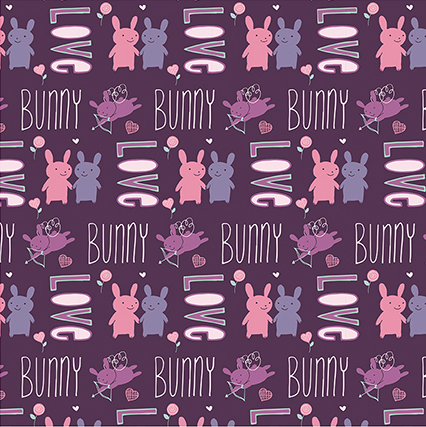 I really love making patterns, and I want to do more of it! 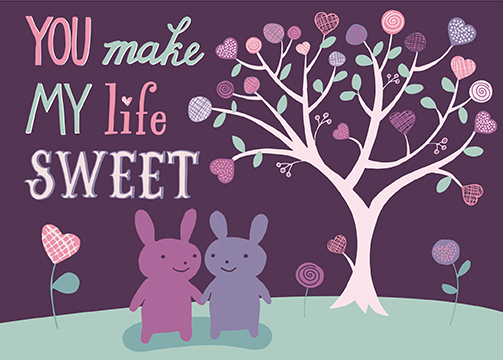 I also like making these cards. It’s a different way of thinking, and it’s been fun to experiment. I had to learn a lot more techniques in Illustrator, so it took awhile to finish the course. 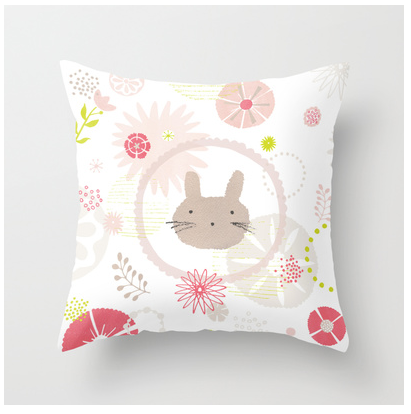 The repeat pattern class was really a great resource for this! 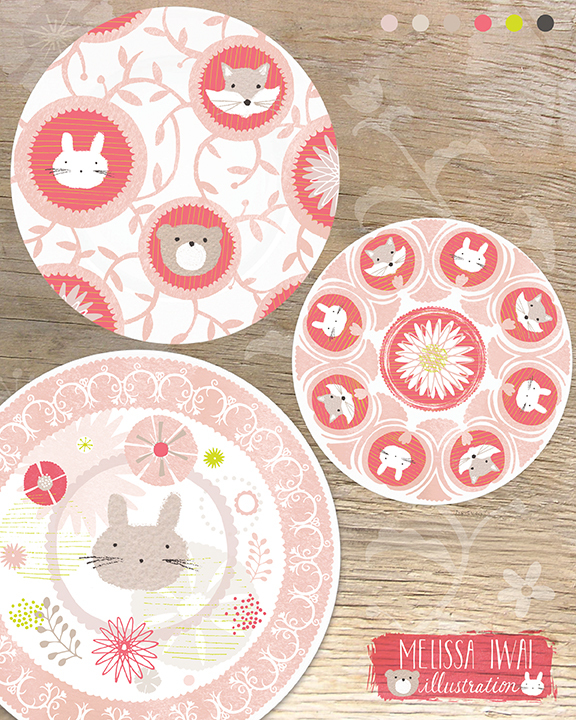 In May, I am going to attend Surtex 2014 at the Javitz Center! For those of you who don’t know, Surtex is a major international licensing conference. Buyers from around the world come to buy or license work from artists and designers. I will be helping Victoria Johnson with her booth. Check out her work — it is so great–she is uber talented! 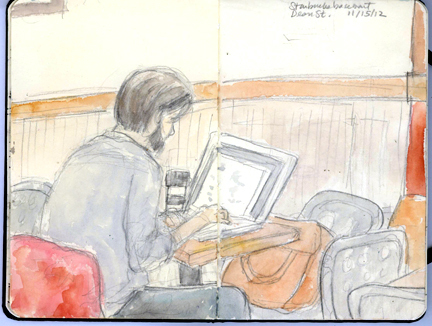 She also writes about her process on her blog. I always love reading about how other artists work. You have probably seen Victoria’s beautiful designs in stores already. Some of her clients include C.R.Gibson, WHSmith, American Greetings, Tigerprint, Hallmark and Marian Heath. I’m really looking forward to meeting her and working in her booth along side Flora Waycott — another talented designer! 1. Prep broccoli by trimming ends and coarse parts of the stems. Slice stems into rounds. Cut florets into pieces. Steam in steamer for 8 minutes. 2. Transfer about 4 cups of cooked broccoli to blender (I used two stocks and saved a lot of the stem pieces for another use). Add about two cups of chicken broth. Blend. 3. Add salt and pepper to taste and blend again. 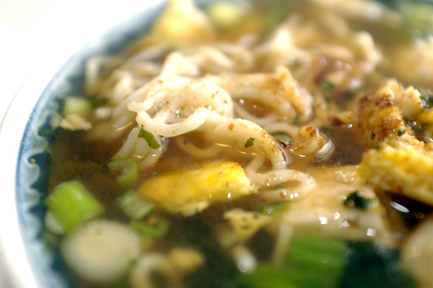 You might also want to add some more broth if you prefer a thinner consistency. Reheat if necessary and serve. Makes about one quart of soup. One thing is for certain is that an old favorite of mine has been re-released as a board book and will be out next month! 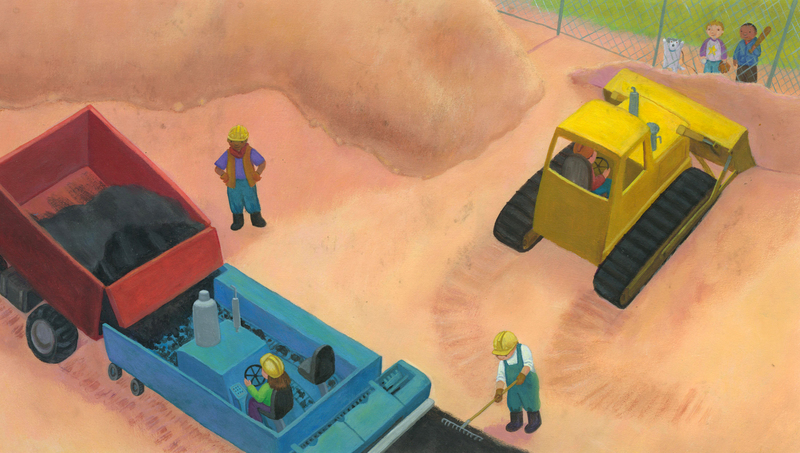 It’s been a perennial favorite among young construction vehicle lovers. It is also a fun way to learn one’s ABCs! There is another “story” taking place in the background about two friends and their puppy. The puppy becomes a dog, and the construction site becomes a… we’ll you’ll have to get the book to see….! 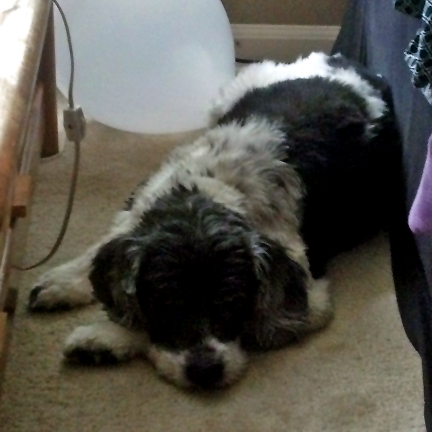 I based the dog on Tilly, my brother’s family’s sweetie, whom we just visited in June. 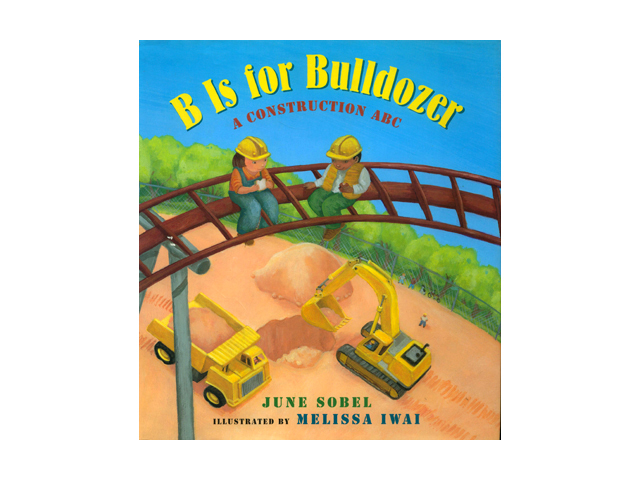 I illustrated B is for Bulldozer long before Jamie was born. I think the original came out in 2002! It’s still in print and available in bookstores, and I’m very thankful for that. 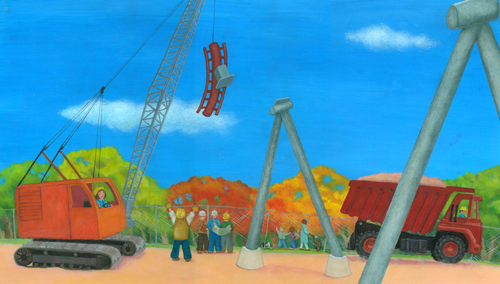 I remember when I was painting it, I amassed a huge collection of construction toys. I used the toys as models for the vehicles, because I wanted a simplified version of the real thing. 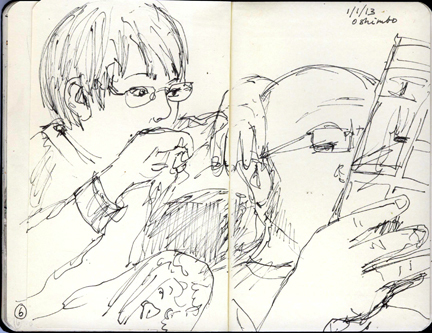 I also like using interesting points of view in my illustrations, so having a 3-D model was useful in figuring out how things would look at different angles. Lucky for Jamie when he was a toddler, he inherited all of my trucks and bulldozers. With school starting soon, I’ve been collecting ideas from friends about what to pack for lunch. I haven’t had to pack a lunch for the last three years because Jamie would eat at school. Next year, they have the option of bringing a lunch or eating the school lunch. The lunches at his sch0ol are really great, so I have a lot of competition! I was approached by Live In Nanny about camp lunch ideas. I think they would be great for school lunches too. Check it out here. My favorite is the Lunch Kit idea. NannyNet also has a roundup of 18 blogs with tips on saving money on lunches and how to make lunches more interesting. I especially like the tip about getting your child involved in making their own lunch, which is something I am planning to do. There are so many amazing bento blogs too. I can’t look at them often, though, because they kind of wig me out — I feel like I should be making these — and then the pressure is too much! Check out these adorable Despicable Me inspired rice balls! 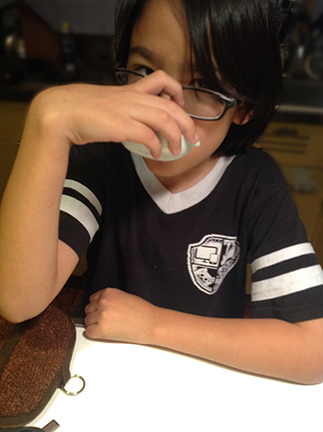 One of his favorites is soup. 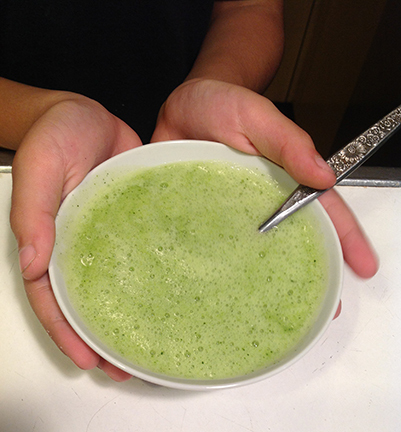 When it gets cooler, I will be sending him to school with a hearty, nutritious soup like this Broccoli Sweet Potato Soup. Steam veggies, add broth, puree. So easy and fast, and so good! Do you have any good tips for healthy kids’ lunches? Poke holes into a sweet potato and microwave on a plate in microwave for about 5 minutes. Cool a bit before handling. Steam broccoli until tender in steamer, about 8 minutes. Peel sweet potato when cool enough to handle and cut until cubes, about one cup. Pour broccoli, sweet potato and chicken broth into blender and puree in batches, being careful not to fill blender more than half way. Remove center cap and cover lightly with a towel while blending. Garnish with parmesan if desired. This means it’s still soup weather! 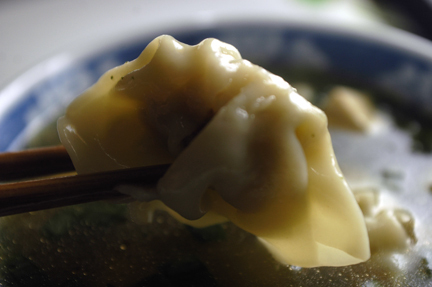 Here is the easiest soup in the world– especially if you use pre-made wontons. 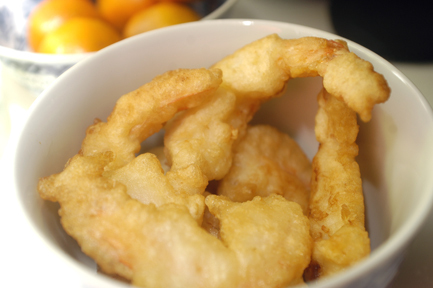 My friend Judy of Bebe Loves Okazu has a wonderful homemade recipe here. 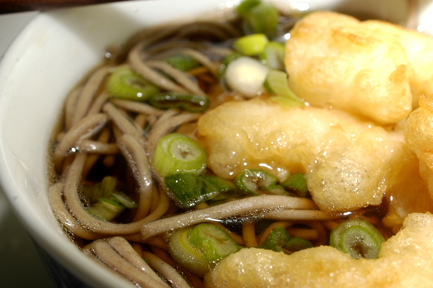 You can make these and freeze uncooked wontons on a plate. When frozen, transfer to a ziploc bag to have on hand for later use. 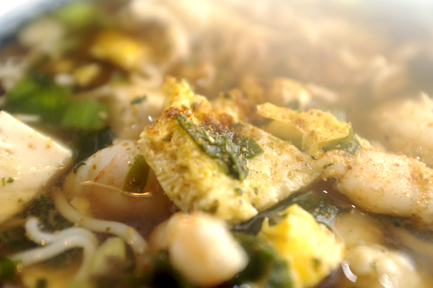 They can be plopped into the broth and simmered in the soup–no need for thawing. Today, I was lazy, and I used Trader Joe’s Chicken Cilantro Mini Wontons. I also defrosted some homemade chicken broth. I simmered the frozen mini wontons in the broth and added some chopped frozen spinach, cubed tofu, a couple of slivers of fresh ginger. When it was all heated through, I added a dash of soy sauce and sesame oil and garnished with chopped scallions. 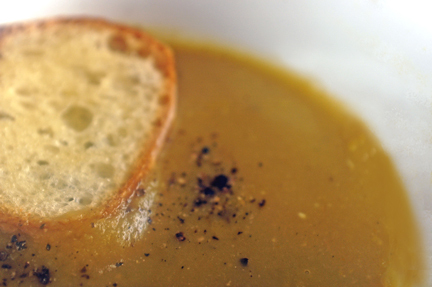 So warming and delicious — perfect for a cold, rainy spring day! Note: You can use whatever you have in your freezer or vegetable bin — try meatballs instead, or use snow peas or frozen peas or edamame. You can’t go wrong either way! 1. Heat broth in a saucepan and bring to a simmer. Add wontons or other cooked meat, tofu, chopped spinach or other vegetable. Simmer until cooked and heated through, about 6-8 minutes. Add soy sauce and sesame oil. Garnish with scallions. Serve. Still not back to normal around these parts… but hopefully soon. This project has dragged on and on, and I have been overwhelmed with the work, I have had no time to do anything else. I am truly exhausted. My family has been so supportive. I don’t know what I would do without them! Here is a painting I did while waiting for ginormous files to save, export and upload. I am donating it to my son’s school auction. 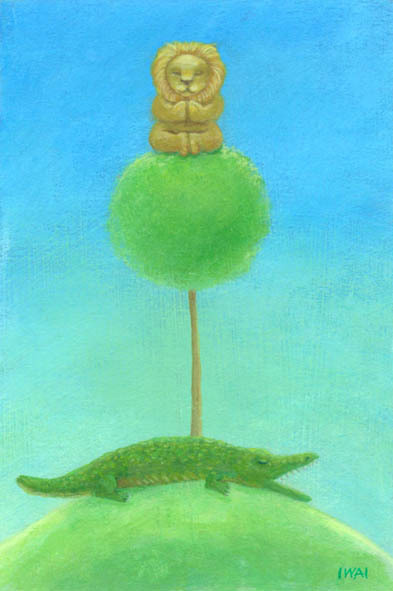 It’s called Meditating Lion, and it’s pretty much the place I want to be in! Will be back with recipes soon. Here’s a good one that I was introduced to by the person I’m working with. It’s so simple I was able to make while waiting for my computer to restart: Take a whole, rinsed chicken. Chop it up into pieces so it can fit into a large pot. Fill pot with water to cover chicken pieces by about an inch or two. Add some salt. Boil for 90 minutes. When it’s done, you have amazingly tender chicken that can be used for soup, burritos, tacos, salad, etc. And you have AMAZING broth. I strained it and chilled and skimmed off the fat (which people would be horrified by — the schmaltz gives it the rich flavor). It is very soothing, and I think helped to stave off an oncoming cold. I made this soup and used the chicken broth and added the shredded cooked chicken at the end. I didn’t have time to take a picture, but it was excellent, and the broth makes all the difference! 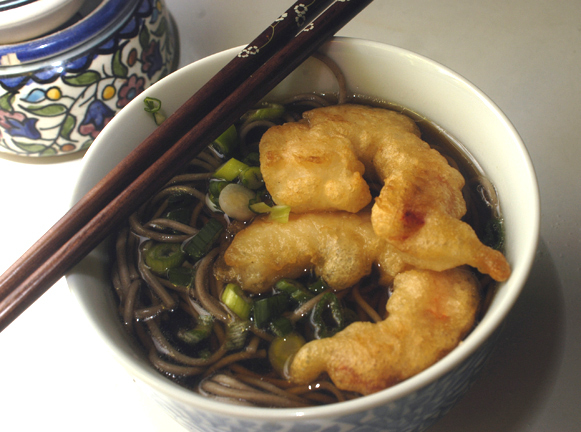 It looked like this, but I put cooked rice in it instead of noodles. By the way, my book, Soup Day, was released in Korea recently! I love how they incorporated the soup spoon in the title in Hangul. I only have to sell about 600 more copies before I can start on the sequel! If you want to help me out, please do! It is in stores and here. Thanks for your patience and support …. be back soon! Have you all made your New Year’s resolutions? Starbucks. 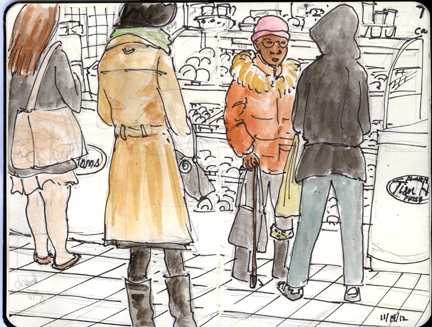 It’s easier to draw strangers when they aren’t facing at me! A lot of people make health oriented goals at New Year’s. I guess the combination of holiday indulgences and pants getting more snug (I’m guilty of this as well!) 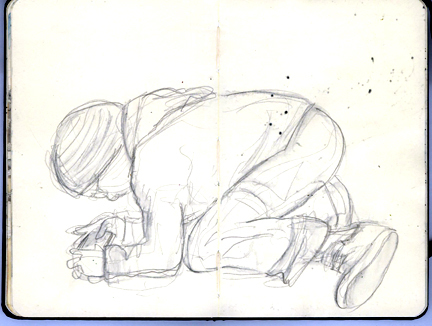 and the promise of a new year — a clean slate– is part of the appeal. With the frigid winter temperatures outside, a hot bowl of soup is a great remedy for the winter chill as well as the tighter waistbands! 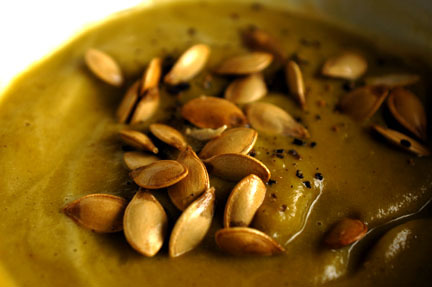 We’ve been enjoying this nutrient dense, filling, and comforting Broccoli Sweet Potato Soup recently. I’m happy to say that even my 8-year old loves this one so much, I don’t have to “hide” what’s in it! It’s so easy to make too if you have a good blender. See recipe at end of post. Served with cheese toast or a salad, it makes a delicious, comforting, healthy, guilt-free, New Year’s Resolutions compliant lunch! Thanks to you all for making 2012 such a great year for this blog! Followers and views doubled from 2011! The most popular post of 2012 was Monthly Lego Build and Double Chocolate Zucchini Bread with Secret Ingredient, one of my favorites. Check it out! 19,000 people fit into the new Barclays Center to see Jay-Z perform. 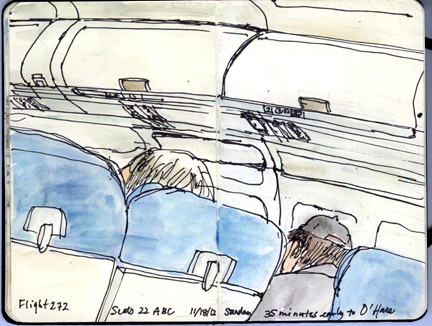 This blog was viewed about 78,000 times in 2012. If it were a concert at the Barclays Center, it would take about 4 sold-out performances for that many people to see it. 2. Prick holes in sweet potato and cook in microwave for 4 minutes. When cool enough to handle, peel and remove flesh. 3. 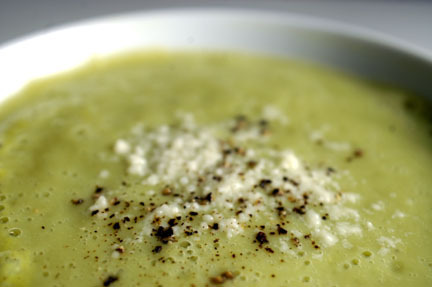 Place broccoli, sweet potato, and broth in blender and puree until smooth. Season with salt and pepper to taste. Add more broth and reheat if you want a thinner consistency. 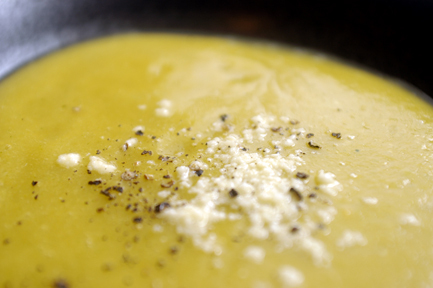 It’s getting colder each day here in New York — you know what that means: Perfect soup weather! It’s our favorite thing to eat this time of year. 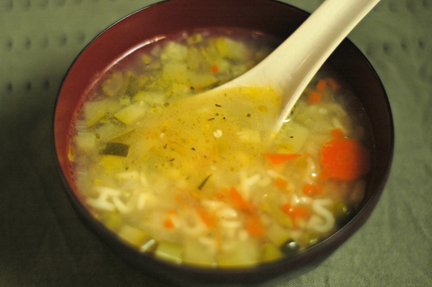 Jamie’s favorite soup – vegetable soup with alphabet pasta – inspired me to write and illustrate Soup Day. The recipe is at the end of the story. Last week I was going through our pantry to collect food to donate to areas in our neighborhood which had been had been hit hard by the hurricane. Among the things I came across was a half filled container of dried peas. I had no idea which presidential administration they were from– perhaps the Clinton era? I decided to risk it and try to make some pea soup in my slow cooker. A lot of recipes I came across called for a ham hock thrown in, but I was too busy to go on a hunt for one, so I used 1/2 cup chopped apple smoked cured nitrite free bacon from Trader Joe’s. It was about 4 slices, and I trimmed off the excess fat. 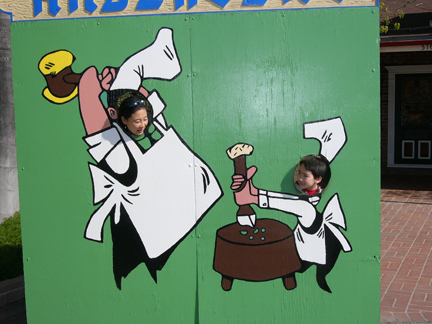 I based my recipe on this one, because it mentioned Pea Soup Andersen’s – a beloved roadside restaurant in the Central Coast of California where I am from. Jamie and I posing as Happea and Pea-wee in the parking lot. It didn’t call for ham hock or bacon, but I decided to throw in some bacon just the same. I also used 4 cups of chicken broth and 2 cups of water instead of all water, and I decided to cook it in my slow cooker instead of on the stove. 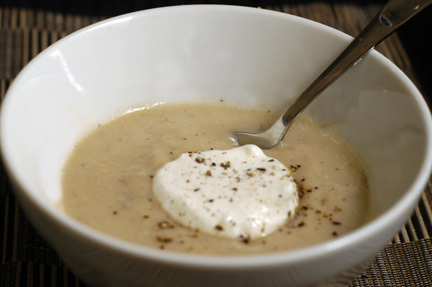 The resulting soup was smoky, flavorful, and creamy — just as good as its inspiration! The amount of dried peas I used cost about $.75, so the whole batch cost about $3.25! It made about ten generous portions, half of which I have stored in our freezer for future winter days. Pour everything into slow cooker. Cook on low for about 8-10 hours or high for about 6-8 hours. Check to see how soft the peas are. I cooked mine for low on 2 hours, but they didn’t seem to be getting soft and I knew they were really old! So I cooked them on high for the next 4 hours. Remove bay leaf. 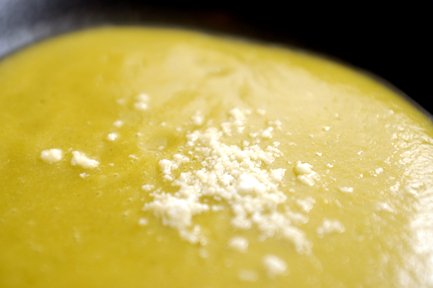 Puree soup in batches in blender until smooth (only fill blender half-way and leave an open vent at the top, either covering with a towel or using a lid with a vent – alternatively, use an immersion blender instead!). Season to taste with salt and pepper. Reheat and serve. Makes at least 10 generous servings. National Soup Month and Soup Day Giveaway! I can’t believe January is almost over! 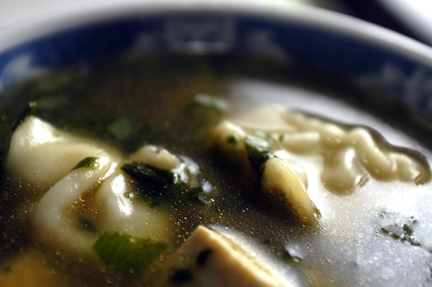 Did you know January is National Soup Month? I’ve been making and eating soup all month with my new Vitamix that my wonderful husband gave me for Christmas. The cool thing about the Vitamix is that you can throw in a bunch of veggies and liquid into the canister and “cook” the soup as you blend. 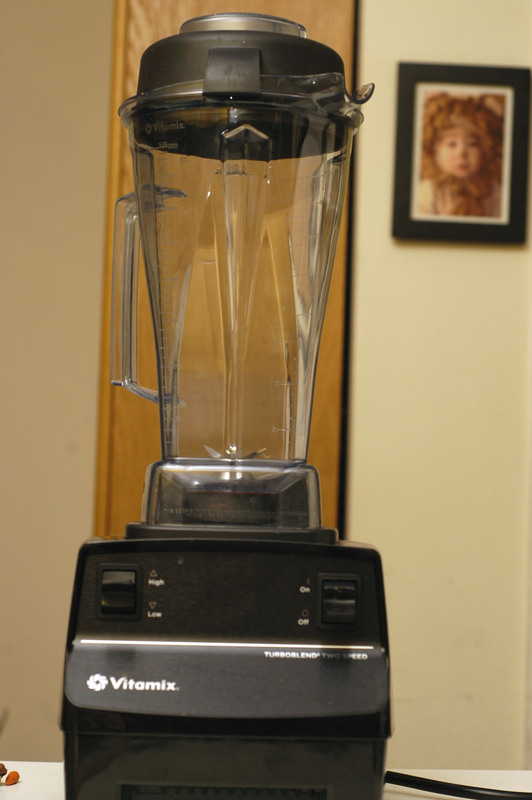 The powerful motor is four times as strong as a regular blender and can run for five minutes on high. This causes friction which creates the heat to “cook” the soup. I’ve been doing a hybrid of stove top cooking and vitamix “cooking” to make my soups. I love to put caramelized onions and/or garlic in my soups, and I find that cooking them on the stove first with seasonings and then blending makes a tastier soup. I am celebrating National Soup Month by giving away a personalized autographed copy of my book, Soup Day (which includes a recipe for Snowy Day Vegetable soup). 1. Leave a comment and let me know what your favorite soup (recipe) is. 3. Follow me on Facebook and leave me a comment about it. 4. Post about this giveaway on your Facebook page with my link (http://wp.me/pNxYO-tW). Contest is open until February 6, 2012, midnight (EST). Soup Day is also available in stores and online. I have already written the sequel, and am required to sell a lot of copies of it in order to make that happen! Thanks for your support! Garnished with roasted acorn seeds and crushed pepper. Roast acorn squash and toast seeds. To see how to do this, check out this post. Cut roasted acorn squash in to large cubes. 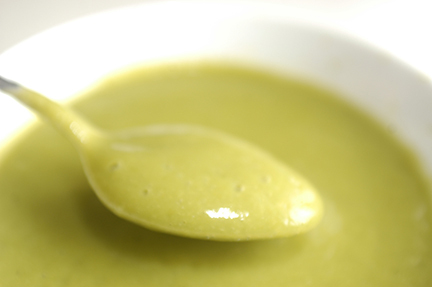 Blend soup with immersion blender or process in blender in batches, being careful not to fill blender more than half way. Remove center cap and cover lightly with a towel while blending. 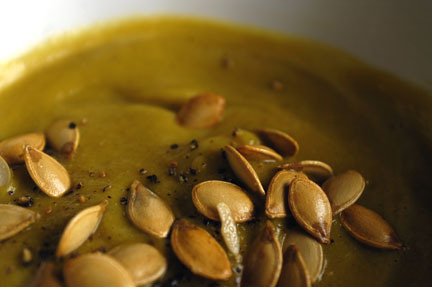 Serve garnished with toasted acorn squash seeds. Garnished with grated parmesan and crushed pepper. Steam cauliflower and zucchini in microwave for about 4-5 minutes or in steamer on stove for about 6-8 minutes. Heat oil in sauce pan over medium heat. Add onion and sprinkle with salt. Saute until soft and translucent. Season to taste with thyme. 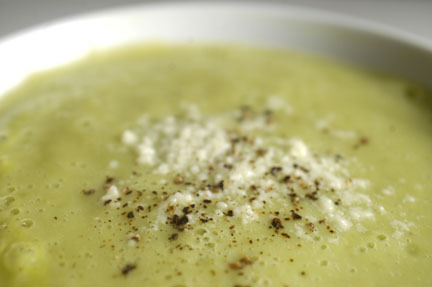 Add parmesan and blend with immersion blender or blend soup in blender in batches, being careful not to fill blender more than half way. Remove center cap and cover lightly with a towel while blending. Garnished with whipped cottage cheese, shiitake, and multigrain cracker. 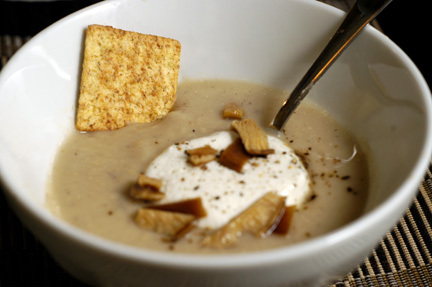 This is a very thick soup – the consistency is that of condensed mushroom soup. If you want a thinner soup, use 1/2 the amount of beans. Place dried mushrooms in a medium sized bowl and pour about ½ cup boiling water to cover. I usually place a smaller dish or bowl on top to keep the mushrooms submerged. Let sit for about 10 minutes. Drain mushrooms, but save the soaking liquid. Meanwhile rinse beans in colander with water to remove excess salt and drain. Saute onion in olive oil over medium low heat until soft. Season with sat and spices. Add shiitake soaking liquid and braise for until liquid evaporates. Add garlic and sauté until softened. Add shiitake and sauté for a few more minutes. Reserve about ¼ cup of sauted mushrooms and onions and set aside. Blend with immersion blender or transfer soup to blender in process in batches, being careful not to fill blender more than half way. Remove center cap and cover lightly with a towel while blending. Add reserved shiitake and onion and pulse to combine. Add more hot broth if you want to thin soup out to desired consistency. Serve with a dollop of creme fraiche, sour cream or whipped cottage cheese.